I made French bread for the first time. It took all day, but was suprisingly simple. 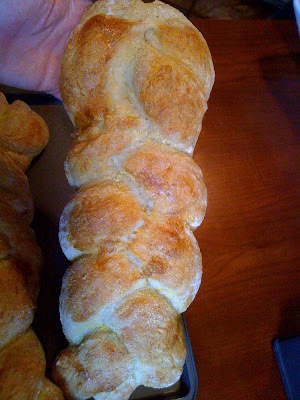 And it makes a very nice addition to any dinner party, since most people don't have the time to make fresh bread. It is essentially the same as white bread, but with sprinkled cornmeal and an egg white brushed on the outside to make the tasty crust. I'm not going to share the recipe yet, because I'm going to tinker with it a bit, like add some olives or rosemary to the mix. I also think it would be wonderful sliced, with cheese and olives baked on top. 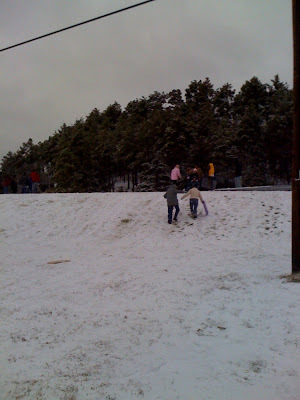 I went for a walk Friday and saw people sledding near the road . They were ridiculously happy! We accumulated about 3 inches Friday night. It made for a very nice, wintery weekend. I've been depressed all day. I saw real video footage of a 3-year-old filly break her leg open on a racetrack and try to keep running on it. This horse, named Ruffian, was born to race. Her father was a half-brother to the mighty Secretariat, and Ruffian, true to her blood, never lost. She had a perfect 10-0 record. In every race, Ruffian would sprint out of the gate to the front of the pack, and continue to distance herself from the other horses. She was absolutely phenomenal! Ruffian's jockey, Jacinto Vasquez, said she had an aura about her, "like Marilyn Monroe, or Raquel Welch." She was tall, elegant, and glistening black. She was everything a race horse should be, and she was insanely popular. 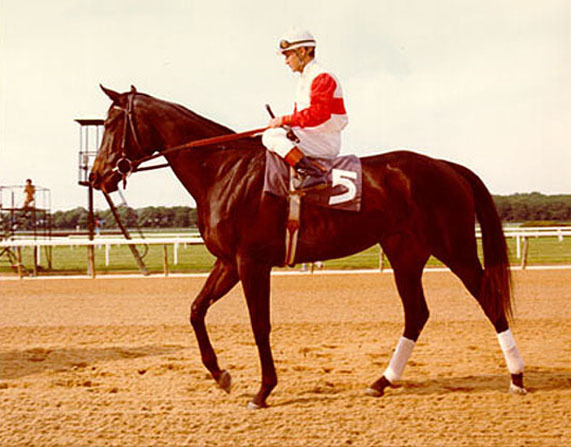 Ruffian's eleventh race was a match against a Derby-winning colt named Foolish Pleasure. This was the first time she would race against a male horse. Ruffian's trainer, Frank Whiteley, was apparently not a fan of match races. Two thoroughbreds racing together will sprint at top speed for the entire mile and a quarter of race track. This is very dangerous for the animals, who are competitive by nature. Whiteley said in an interview that Ruffian's owners told him they would "have to do this sooner or later." This equine "Battle of the Sexes" between the top two horses in the nation drew thousands of spectators, but it ended in the worst way possible. During the race, Ruffian pulled to the lead, as she always did. Suddenly, she slowed down as her right leg snapped in two. She continued to run, pounding the exposed bone into the ground. Vasquez tried desperately to slow her down. Surgery was done to set her destroyed leg, even though her veterinarian said she had less than a 10% chance of recovering. Ruffian began thrashing around after awakening from anesthesia, and she broke another leg. She was euthanized on July 7, 1975. "It was one of the most incomplete, unsatisfying experiences that I've ever had. It was...the unfinished symphony of horse racing..." said Bill Nack, a journalist who covered Ruffian's races. "For me, it lost...the glow of romance that the sport had for me, since I was a kid." Ruffian's entire body is buried at Belmont Park in New York, where she died. And she is facing the finish line. "I like the best of everything. Except bowling." This was the best Christmas break I have ever had. I'm not sure why exactly, but it may be because I went to visit my family for a positive reason, and not because one of them was in intensive care. 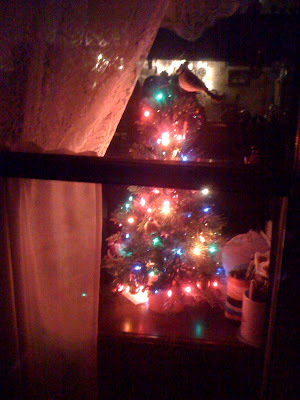 I had also set out with the goal of digitally recording an interview with my 93-year-old grandmother (that's her Christmas tree in the photo here), which I accomplished, and I spent some fun time with several old friends who just happen to live 500 miles away from me. These are all good things! Because my parents live in a small town, I usually run into several people I know. On Christmas Eve, I saw some old neighbors who had helped me through a troubled time. I also ran into an old friend who I spent time with in college. She was single back then, but she married the county judge not long after our dancing days. She and her husband are both good-looking and charismatic, and he went on to become the district attorney. She told me they didn't know how good their life was when he was a judge; earlier in the year, someone had been murdered and the body was dumped on their farm as a message. He was particularly upset because he knew the family of the deceased. My family has at least two Christmas traditions that I look forward to every year. On Christmas Eve, everyone opens one present. This tradition stems back to the days of us begging Mom and Dad to let us open one little thing from the gargantuan mound of presents taunting us. I remember one year I had received an "E.T. the Extra-Terrestrial" puzzle that a neighbor had given me. I was sitting at the kitchen table, piecing it together when the neighbor came over, and I tried in vain to cover the puzzle so she wouldn't know that I had opened it before Christmas. 2 years ago, my sister and my nephew and I walked to the back of my parents' farm to the large pond. We were shocked and ecstatic to find at least 6 river otters swimming around in our pond. My family has lived on this farm for 25 years, and no one has ever seen an otter on the property. We ran back to the house and got hot dogs and buns (who knew what otters would eat?) and tossed them into the water. Where they stayed. Apparently otters don't like bread and raw hot dogs....but we tried! The next day, the otters were still there. It was amazing to see them. I had only seen otters in zoos previously. They were not there on the third day we traveled to the back pond, and we never saw them again until the following Christmas. Amazingly, on Christmas day in 2008, there were two otters swimming around in that same pond. Where did they come from? There weren't any rivers or creeks near by. They were gone the day after Christmas, and still gone the day after that. But since we were lucky for 2 Christmases in a row, it has become a tradition to walk to the back pond on Christmas day and look for the Christmas otters. I'm sad to report that there were no Christmas otters for 2009. And the back pond has dwindled in size because a neighbor has tampered with the supply spring. I started making a quilt with a good neighbor friend who could only be called a Master Quilter. Darlene takes quilting to new levels, and she does not consider herself traditional in this craft. I have been really impressed with the quilts she has made in the past. She has an entire room in her house dedicated to quilting, complete with multiple sewing machines, a quilting machine, and a huge design board on the wall. We sat for hours during the holiday, snipping, sewing, planning, talking. We took short breaks to eat, but I did actually sew right into the new year! Darlene said she and her quilting buddies sometimes stay up to 4:00 in the morning, sewing and talking. This is a new world for me. I think I like it! Since I have started riding horses again, I decided to trek back to some of the places I once traveled with my former horse friends. In Franklin, TN, there is a nice English equestrian store called Judy's Tack Shop. I traveled there years ago...like 14 years ago...with Phyllis and Megan, who had just lost their beloved Catherine. Catherine liked to compete in 3-day eventing, which is basically an equestrian triathlon. I was in awe of her. I did well to stay on a horse, much less run and race and jump on one. I was devastated by her death; my new friend, who I was just beginning to know. Her mother was kind enough to take me around shopping with her and her other daughter, Megan. We went to eat at some neat little place in Franklin called The Bunganut Pig, and Phyllis bought me a t-shirt. The manager signed his name and wrote "Come back" on my shirt with a permanent marker. I did come back...14 years later. I saw my good friend Patricia, the red-headed Highlander, and I got to be her first-foot-in again this New Year! (I explained this in a previous blog...the first person to walk into your house during a new year is your first foot in. This is apparently a big deal in Scotland...) Patricia makes the best hot tea that ever was, and she says in response, "Well I should - I'm British." I also saw my friend Donna - the excellent cook! She taught me how to make croutons this trip. We ran out to The Fresh Market, which is one of my favorite places to shop, and we assembled a wonderful Caesar salad for dinner. Donna makes cooking look simple, which means she's skilled. The best Fillet Mignon I ever had was at her house a few years ago, and she swears it is the easiest thing ever to grill. My friend Melanie and I always pair up during the Christmas break. She lives in Michigan, but her Mom resides in the same little town as my parents. So we get together, put on heavy winter clothes, hats and scarves, and we drive my little car around with the top down. This is our tradition - done in the spirit of our late friend, Marisa Brown. It was good to see the Keans again, as always. I have known them since I was 14, and they have always been a positive influence on me. I rode their horses when I was in high school, I went to my first horse show with Debbie, and I went on vacation to Key West with the Keans. They even bought me my first Enya CD for my 15th birthday. (I have collected all of them since.) I distinctly remember eating breakfast with them the first time I stayed at their house in the early nineties. Mr. Kean was hypothesizing that little businesses purposely put as many grammatical errors as possible on their signs. I watched him and Debbie talk, and I thought,"These people actually talk to each other! Like a real family!" I had never seen that before. And they talked to me, like I was a real person, and not just some 14-year-old nothing. Their daughter told me later that they really liked me, and in fact, they liked me the best out of all the other friends she had brought home. I can't tell you how much that meant to me. I had dinner with Ms. Cheryl - one of the first true Christians I ever met. I do not always get to see Ms. Cheryl every break, but she is a special person to me. We have worked together twice before, and this lady is as ethical as they come. During my time of despair, we would talk in the break room about my situation. She turns to her faith for guidance, and that is what she shared with me. She gave me her most precious Nave's Topical Bible. I knew it was a very important book to her, and she gave it to me. How about that for an incredible friend? Earlier in 2009, I was rummaging through a used book sale, and I saw a very familiar-looking book. YES! 10 years after Ms. Cheryl gave her precious book to me, I found an identical edition. I bought it and gave it to her at dinner this week. I do not travel to the Huntsville, AL area without seeing the Hoovers. I do not! A good family friend recently asked me how I found the most influential people in my life, and the Hoovers were the first people I thought of. I first met Dr. Hoover when I was 18, at a public seminar at the Huntsville Public Library. He was speaking about the recent news of a Martian meteorite that may have contained biomarkers of life. I was blown away by what he was saying, and I knew right then I had to become a biologist. I have been enthralled with the Hoovers since I met both of them, and Miss Miriam and I have traveled to space conferences together. And I'm not going to talk about the date I went on because I don't blog about those things. But what a FABULOUS Christmas break! Please reference this site when using any of my material. I am a science enthusiast who teaches anatomy, physiology, and botany courses to college undergraduates. I am in the process of working on my Ph.D in plant science with an emphasis on fruit breeding. I blog about things that interest me, and about people who inspire me. If you detect any errors in my writings, please let me know via the comments. Enjoy the ride! Al Matthews - the Real Life Marine in "Aliens"